"Divergent 2" redirects here. For the second film in the Divergent film series, see The Divergent Series: Insurgent. The book was first published on May 1, 2012, by the HarperCollins imprints Katherine Tegen Books in the U.S. and HarperCollins Children's Books in the UK, and a "Collector's Edition" was published on October 30 in the United States. Insurgent received mostly positive reviews from critics, with reviewers praising Roth's writing. The background to the story, revealed in the first novel of the trilogy, explains how Chicago in the post-apocalyptic far future is now a society that defines its citizens by strict conformity to their social and personality-related affiliation with five different factions, which removes the threat of anyone exercising independent will and re-threatening the population's safety through war or some other human-created catastrophe. The factions are Abnegation for the selfless, Amity for the peaceful, Candor for the honest, Dauntless for the brave, and Erudite for the intelligent. Those who are tested with equal aptitude for more than one faction are deemed "Divergent". Due to their capability for independent thought beyond the restrictive nature of the factions, Divergents are considered threats to the society, hunted and killed by the ruthless leader of Erudite in order to eliminate the "threat" of independent thinking. Factions are meant to be a lifetime allegiance, far more important than family—"faction before blood" is a societal motto. Those who fail the initiation of their particular faction or subsequently leave it are "factionless", a permanently homeless underclass deemed to be a drain on society. After the events of Divergent, Beatrice "Tris" Prior, Tobias "Four" Eaton, Caleb Prior, Peter Hayes, and Marcus Eaton seek refuge in the Amity sector. Tris overhears Marcus and Amity leader Johanna Reyes discuss the fact that the Abnegation leaders died to protect secret information. Erudite and the Dauntless traitors arrive to arrest the Divergents, but Tris flees with Four, Caleb, and Susan Black on a train to the factionless sector. There, they meet Tobias' mother, Evelyn Johnson-Eaton, who tries to persuade her son to sway Dauntless into joining forces with the factionless against Erudite. While Caleb and Susan return to Abnegation, Tris and Tobias head to Candor headquarters, where the other Dauntless now reside. Under truth serums, Tobias confides his reasons for transferring to Dauntless, while Tris reveals her killing of Will in self-defense, which strains her relationship with her friend Christina. That night, the Dauntless traitors, led by Eric, arrive and shoot simulation serums into their fellow Dauntless, knocking everyone unconscious except the Divergents — Tris, Uriah Pedrad, and several others. As Eric begins executing the Divergents, Tris wounds him, allowing the others to capture him as the remaining traitors flee. Their safety is revealed to be guaranteed by Erudite renegade and Will's sister, Cara. Tris, Tobias, Lynn, and Shauna spy on the discussion arranged by Candor leader Jack Kang with Jeanine Matthews's representative and Dauntless traitor, Max. Lynn shoots and kills Max, while Shauna is rendered paraplegic by a nerve serum. To prevent Jeanine from holding another prisoner exchange, the Dauntless vote to execute Eric, which Tobias does without hesitation. To avoid dependance on Candor, the Dauntless return to their own headquarters and disable most of the security cameras inside. However, Tris is alerted by Christina that one camera has caused three Dauntless members— Marlene, Hector, and Kee—to become simulated into attempting suicide unless a Divergent is handed over; they are unable to save Marlene. Tris surrenders to Erudite and is placed in a cell by Peter and, to her shock, Caleb, both of whom are working with Jeanine. Tobias follows and is captured, but not before convincing Dauntless to ally with the factionless, with their insurgency arranged in several days’ time. After unsuccessful simulation tests, Jeanine orders Tris' execution, but Peter swaps the lethal dose with a paralytic and frees Tobias, and the three escape to Abnegation. Tris meets with Marcus, who tells her that Jeanine is withholding Abnegation’s secret; should the factionless learn of it, it would certainly be destroyed. Tris, Christina, and Marcus head for Amity to request Johanna's help. She, alongside several others including Susan's brother, Robert, choose to assist them despite Amity's resistance. They are joined by Cara and another Erudite renegade, Fernando, who act as navigators. The "Insurgents" infiltrate Erudite headquarters; Fernando is killed, but they manage to access Jeanine's laboratory. Inside, Tris faces down simulations before confronting Jeanine, who is cornered by Tori Wu. Tori kills Jeanine, then brands Tris a traitor. The invasion of Erudite over, Tris learns of the casualties, including Lynn, and that the factionless have taken all weapons to rule in Jeanine's place. Tris is handcuffed alongside Christina, Marcus, and the other Insurgents, but is able to pass the information to Tobias, which he and Caleb share through the computers. The secret video, narrated by Edith Prior, from "an organization fighting for peace", reveals that the world had become corrupt, and the city was sealed to allow the Divergents to increase, after which Amity was to open the fence forever and allow the population to re-enter the world. The room erupts in voices as the book ends. The setting is a dystopian Chicago in the far future, where Lake Michigan has turned into a giant marsh. The Candor compound surrounds a ruined Merchandise Mart, called by them the "Merciless Mart" due to their unrelenting honesty. The Amity live on farms, located outside a fence that surrounds the city (and keeps the other factions in); their central meeting area is a building with a great tree in the center. The Dauntless compound is the combination of a glass building and a deep cave underneath it, nicknamed "The Pit." The Abnegation sector is a cookie-cutter neighborhood, where "everything looks alike." The Erudite compound is in a futuristic part of the city, including the former site of Grant Park (a sculpture resembling the famous "Cloud Gate" is mentioned in Divergent) and the buildings are very advanced. In the US, the book was released in the paperback format on January 20, 2015. The standard retail version includes previously unreleased material (deleted scenes). There are also several retailer exclusive versions at Barnes & Noble, Books-A-Million, Target, and Walmart, each with different deleted scenes and Q&As with author Veronica Roth. Insurgent received mostly positive reviews from critics. Trade publication Publisher Weekly received the novel enthusiastically: "Roth knows how to write. So even though this second book of the trilogy that began with Divergent feels like a necessary bridge between the haunting story she created in book one and the hinted-at chaos of book three, readers will be quick to forgive. . . The author has a subtle way of pulling readers into a scene (“The outside air.... smells green, the way a leaf does when you tear it in half”), and the novel’s love story, intricate plot, and unforgettable setting work in concert to deliver a novel that will rivet fans of the first book." Kirkus Reviews said "The unrelenting suspense piles pursuit upon betrayal upon torture upon pitched battles; the violence is graphic, grisly and shockingly indiscriminate. The climactic reveal, hinting at the secret origins of their society, is neither surprising nor particularly plausible, but the frenzied response makes for another spectacular cliffhanger." Roth has admitted a number of continuity errors in Insurgent, an aftereffect of overlapping novel drafts. Insurgent won Favorite Young Adult Fantasy & Science Fiction and Author of 2012 in 2012's Goodreads Choice Awards. It was also nominated at Children's Choice Book Awards for Teen book of the year and Author of the year. Summit Entertainment announced that a film adaptation of Insurgent would be released as The Divergent Series: Insurgent on March 20, 2015, as a sequel to the film adaptation of Divergent with Brian Duffield originally chosen to write the script for the film. On December 16, 2013, it was announced that Neil Burger, director of Divergent, would not return to direct Insurgent, due to his still working on the first film. On February 13, 2014, it was announced that Robert Schwentke was offered the director position for the film and that Akiva Goldsman had been hired to re-write Duffield's script. The Divergent Series: Insurgent began filming in Atlanta on May 27, 2014, and concluded on September 6, 2014. ^ a b c Divergent Universe series listing at the Internet Speculative Fiction Database (ISFDB). Retrieved March 25, 2014. Select a title to see its linked publication history and general information. Select a particular edition (title) for more data at that level, such as a front cover image or linked contents. ^ a b Insurgent (First Edition). Library of Congress Catalog Record (LCC). Insurgent (Collector's Edition). LCC. Retrieved March 25, 2014. ^ "Insurgent (Divergent Series #2) by Veronica Roth". Retrieved September 3, 2013. ^ "The second book of the bestselling Divergent series takes far too many twists and turns". Retrieved September 3, 2013. ^ "Insurgent, by Veronica Roth, 2012, Book Review". Retrieved September 3, 2013. 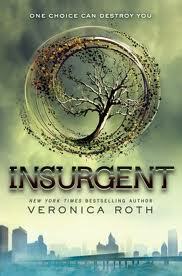 ^ "Book Review: Insurgent". Archived from the original on September 4, 2013. Retrieved September 3, 2013. ^ "Interview: Veronica Roth on her book 'Insurgent' and feminism". Los Angeles Times. April 30, 2012. Retrieved September 3, 2013. ^ "Review: 'Insurgent' by Veronica Roth". USA Today. Retrieved September 3, 2013. ^ "INSURGENT: SECOND BOOK IN THE DIVERGENT TRILOGY". Archived from the original on August 21, 2013. Retrieved September 3, 2013. ^ "Barnes & Noble Exclusive". Retrieved 15 March 2015. ^ "Books-A-Million (BAM) Exclusive". Retrieved 15 March 2015. ^ "Target Exclusive". Retrieved 15 March 2015. ^ "Walmart Exclusive". Retrieved 15 March 2015. ^ "Insurgent Veronica Roth. HarperCollins/Tegen". Retrieved September 3, 2013. ^ "INSURGENT From the "Divergent" series, volume 2 by Veronica Roth". Retrieved September 3, 2013. ^ Roth, Vernoica. "Errors: Why They Happen, How to Better Avoid Them". Retrieved June 2, 2013. ^ "winners of the 2012 Goodreads Choice Awards". Goodreads.com. Retrieved 3 September 2013. ^ "2013 Finalists and Winners". Goodreads.com. Retrieved 4 September 2013. ^ Trumbore, Dave (December 16, 2013). "Summit Sets Release Dates for DIVERGENT Threequel ALLEGIANT, Plus GODS OF EGYPT and STEP UP ALL IN". Collider.com. Retrieved December 17, 2013. ^ Trumbore, Dave (May 7, 2013). "Summit Sets Brian Duffield to Pen DIVERGENT Sequel, INSURGENT". Collider.com. Retrieved September 3, 2013. ^ "Divergent Sequel Insurgent Adaptation Gets A Writer". Retrieved September 3, 2013. ^ "'Divergent' Director Neil Burger Won't Do Sequel (EXCLUSIVE)". Retrieved December 17, 2013. ^ "Robert Schwentke To Direct 'Divergent' Sequel 'Insurgent'". Retrieved February 13, 2014. ^ "Summit announces director for 'Divergent' sequel". Retrieved February 13, 2014. ^ "'Divergent' Sequel 'Insurgent' Starts Filming in Atlanta May 27th!". Retrieved 27 April 2014. This page was last edited on 1 April 2019, at 05:30 (UTC).